Essex, England, 1645. With a heavy heart, Alice Hopkins returns to the small town she grew up in. Widowed, with child, and without prospects, she is forced to find refuge at the house of her younger brother, Matthew. In the five years she has been gone, the boy she knew has become a man of influence and wealth--but more has changed than merely his fortunes. Alice fears tha Essex, England, 1645. With a heavy heart, Alice Hopkins returns to the small town she grew up in. Widowed, with child, and without prospects, she is forced to find refuge at the house of her younger brother, Matthew. In the five years she has been gone, the boy she knew has become a man of influence and wealth--but more has changed than merely his fortunes. Alice fears that even as the cruel burns of a childhood accident still mark his face, something terrible has scarred Matthew's soul. To ask other readers questions about The Witchfinder's Sister, please sign up. Does this book have any gothic/horror in it ? Or is just lovey dovey ? Long before the Salem witch trials, there were the Manningtree witch trials in Essex England, and for many women it was a time of pure terror. London 1645, and Alice Hopkins finds herself pregnant, and having to return to her home village of Manningtree, Essex, after the death of her husband. She will be living with her brother Matthew Hopkins 'The Witchfinder General'. Matthew is a cruel, troubled, sullen individual, with a persona of evil about him. Alice discovers that not only is Matthew a ma Long before the Salem witch trials, there were the Manningtree witch trials in Essex England, and for many women it was a time of pure terror. Alice discovers that not only is Matthew a man of influence these days, but he is also a merciless hunter of witches! His very name incites terror in the hearts of ordinary people for miles around. Alice does her best to reign Matthew in, but he won't be thwarted in his quest to bring these so called witches to trial. In trying to understand his motives, she also uncovers some dark secrets going back to when they were very young, but in doing so, she puts her own life in peril. Oh boy, this was a harrowing tale, made more so by the fact that Matthew Hopkins actually existed, and the trials are well documented. He took the office of Witchfinder General upon himself, very much self appointed, and he was never officially recognised by parliament. Women were tried as witches for the most menial of things - some were just a bit different, a little eccentric, some were lonely individuals unable to fend for themselves, or perhaps some of them had mental health problems - some were even reported for witchcraft by neighbours with a score to settle. But whichever means brought them to Hopkins attention, one thing was for certain, they were doomed. He and his henchmen were responsible for over 100 women going to the gallows. Though this story is based on fact, the author has woven a fictional tale around it, for it isn't known whether Matthew Hopkins actually had a sister. All I can say is that Beth Underdown has created a wonderful historical thriller, and though the subject matter is really heartbreaking to read at times, it is SO worth it. An excellent debut novel! Alice Hopkins is a pregnant widow who must return to her hometown of Manningtree, Essex, to reside with her brother, Matthew Hopkins. She has not seen him in five years and finds that he has changed. He is no longer the young man who loves scripture. Matthew is now a man with power and influence. He has become a powerful man who is feared as he is a hunter of witches. He has a list of names and carefully takes notes as he interviews those who have been accused of witch craft. Alice tries to change his mind, but soon finds his mind cannot be changed. He is on a mission and soon makes her take part in his witch hunts. Witch hunts that occurred in England. Matthew Hopkins was a real witch hunter who in fact "is believed to have been responsible for the executions of 300 alleged witches between the years 1644 and 1646" (information from Wikipedia) In his short reign more people (mainly women) were hanged than in the previous one hundred years. Can you even imagine what it was like to live during those times? One need only blink the wrong way and be accused. If people did not like you, if you were the least bit different, if you did not comply with societal norms, or someone had a grudge against you - you could be accused. I love books written about real events and/or people. I also happen to love books about witches and accused witches. This book was no exception. In the Author's notes she tells where she took liberties (a lot) and made up characters (i.e. Alice Hopkins) and where she interwove fact. Be sure to read that section as well! I found this book to be well-written and compelling. This book is thought provoking and frightening. What a scary time in history - this book showcases the horrific treatment and persecution of those accused and the ways in which women were proven to be witches. I love books that not only entertain but educate and evoke feeling. I am quite familiar with the Salem Witch Trials in the U.S. and thorough this book learned about witch hunts that took place in England. A lot of research went into this book and I thought she did a great job writing a story around real events and a real person. It's heartbreaking to think about what women endured and suffered during those times. 3.5 Manningtree, the Essex witch trials, in the two years between 1645 and 1647, hundreds of women were investigated and hanged as witches. Matthew Stafford was called the witch finder, a man who for unknown reasons pursued across many counties all rumors and gossip of supposed witches. In this novel the author attempts to give us a reason why Stafford acted and believed as he did. Our narrator is Eliza, Matthew's sister, who has returned to Manningtree, after the death of her husband, a marriag 3.5 Manningtree, the Essex witch trials, in the two years between 1645 and 1647, hundreds of women were investigated and hanged as witches. Matthew Stafford was called the witch finder, a man who for unknown reasons pursued across many counties all rumors and gossip of supposed witches. In this novel the author attempts to give us a reason why Stafford acted and believed as he did. Our narrator is Eliza, Matthew's sister, who has returned to Manningtree, after the death of her husband, a marriage Matthew has heartedly disapproved of, pregnant and without means. She will, unwillingly, become embroiled in Matthew's continuous and unceasing hunt for witches. Despite her efforts to change Matthew's course, she is largely unsuccessful but she does discover many secrets kept within her family. This was a dark time and it is to be expected that this is a very dark book. The atmosphere is deftly done, authentic seeming to the period. What was done to these women by those who were either jealous, coveted their goods, or just by fear, was horrific. So many were elderly, without family and all were powerless against the witchhunter, who was bent on finding evidence in whatever way possible. A hard book to read because we know this really happened and few attempted to stop it. The author takes us to the end of Matthew's life, which fortunately wasn't very long. An author's note is included telling us what was true or not and provides details of her research. The ending of the book was both ironic and somehow fitting. Quite well done. "These last months, I have learned that the acknowledged history that belongs to the daylight, that is not the only history. Turn over the stone and you will find another history, wriggling to escape." It is the seventeenth century in England, and while Civil War occupies the minds of both soldiers and citizens, one man has the opportunity to follow his own agenda without interference. Termed the Witchfinder, Matthew Hopkins has a list of names and scours the countryside of Essex and Suffolk in s "These last months, I have learned that the acknowledged history that belongs to the daylight, that is not the only history. Turn over the stone and you will find another history, wriggling to escape." It is the seventeenth century in England, and while Civil War occupies the minds of both soldiers and citizens, one man has the opportunity to follow his own agenda without interference. Termed the Witchfinder, Matthew Hopkins has a list of names and scours the countryside of Essex and Suffolk in search of those accused of witchcraft. It is a time of suspicion and fear, and author Beth Underdown effectively conveys the tension through her skillful writing. This is a fictional story, but with roots embedded loosely in true accounts of the time. Matthew Hopkins was a real person, but it is unknown whether he in fact had a sister or not. In this novel, Alice Hopkins is both narrator and sibling to the witchfinder, and it is through her that we learn of a year full of accusations and darkness. Alice has just returned to her hometown of Manningtree following her husband’s death. She, along with her unborn child, seeks refuge with her brother with whom she hopes to reconcile after five years of disagreement and silence. While Matthew quickly takes her in and provides shelter, Alice soon comes to realize that it will be at a great cost to her. Murmurs of a book of names as well as hushed gossip about certain women of the town swiftly reach her ear. Upon settling down at the inn where her brother currently resides, Alice learns that it is from these headquarters, so to speak, that Matthew conducts his loathsome business. Before long, Alice will be unwillingly induced to assist with his acts of questioning and testing the accused. "Suddenly I felt the low simmer of threat." I can only imagine the terror of that day and age. In particular, if you happened to be a woman that was unconventional in any way, shape or form – independent, mentally unstable, promiscuous, or just plain eccentric – it seems you were not safe from being labeled as a witch. Perhaps your neighbor didn’t like you, or you gave another woman’s husband a second glance – witch! Through Alice, we also glimpse a piece of Matthew’s past. They were very close siblings at one point in time, with Alice likely being Matthew’s only real friend. Alice understood him and nurtured him; he depended on her devotion. But there is a secret lurking in the background as well, and Alice tries to put together small pieces of a puzzle that she never before questioned as being incomplete - until now. Perhaps she can make sense of the madness. Maybe she can convince Matthew to cease his accursed mission. I thought that this was a very well-written, interesting piece of historical fiction. Underdown’s writing is suspenseful and engaging, and seemed to be a well-researched and realistic portrayal of the witch hunts of this period. The book is in no way melodramatic; rather a thread of unease and a haunting tone are woven throughout. This is not a gruesome, hide-under-the-covers sort of a read, but a chilling reminder of what can go wrong when paranoia, prejudice and abuse of power get into the minds and hands of misguided and wicked human beings. "For it is a choice, I think, to close the heart, just as it is a choice to open it. It is a choice to look at what distresses you, and a choice to shut your eyes." It has been 15 days since I read The Witchfinder’s Sister, and I still don’t know what to think about it. That happens rarely to me, almost never. I have to warn you that my review will probably be all over the place because I am still finding the words to express my thoughts, but there is one thing I can say for sure: The Witchfinder’s Sister left me confused. The story follows Alice Hopkins who returns to her childhood town to live with her brother Matthew, after a tragic death of her husband. Since she saw him last time, Matthew changed. He gained a lot of respect and hangs out with powerful men. His job is to “expose” witches, put them on trial and punish them if they’re found guilty. First thing that has to be stress out is that Matthew’s character is based on real person who lived in 17th century in England, and who is responsible for many of lives lost because women were accused of practicing witchcraft. Despite that, this novel is piece of fiction. It is told in first person, from Alice’s point of view. I can’t say if the language in this book is authentic to the one that was in use in 1645, but it sounds a bit different from today’s modern English, but at the same time it reads pretty quickly. The first third of the book was excellent. The author really managed to describe the cold atmosphere that I imagine was present in that time. I also liked how it wasn’t clear if the paranormal aspect was really present in the plot, or was it just in the minds of people that live in this book. There was a point where I had to stop reading because I was too scared (and it was bedtime, so I didn’t want to have a sleepless night(I feel obligated to also tell you that the “problem” was in my head and the book isn’t as scarry as I was afraid it would be)). The second half of the book was boring, which is a shame. There were so many descriptions and so little conversations. I wish we got to see more scenes from trials, but instead we got scenes with Alice hanging out with accused woman. However, parts where she’s discovering mysery around her brother were really interesting. I still don’t know what to think about the ending part related to Matthew. It was somewhat unusual, that is for sure! The end was good. I really, really liked the last sentence. Overall, I liked the story in general, but I think it could have been told in more interesting way then it was. It had potential to be even better. 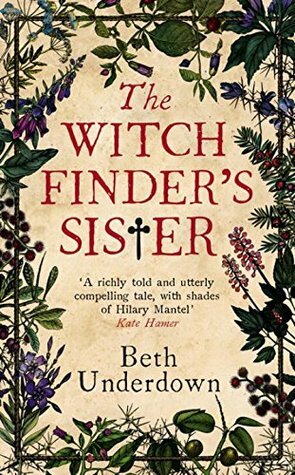 The New York Times Book Review says Beth Underdown’s The Witchfinder’s Sister is “a novel for our times…” and if that is true, I fear for both our times and the quality of literature it produces. I mean no offense to the reviewer or to the author for that matter, but I wholeheartedly disagree with the assessment and am not inclined to pretend otherwise. The novel centers on the fictitious Alice Hopkins. For those who aren’t aware, publishers don’t like narratives about men, so to tell stories like that of Matthew Hopkins, authors are forced to rely on gimmicks that allow them to approach male characters from female points of view which likely explains how the historic headliner of this particular publication came to occupy a supporting role in his own story. I find the trend annoying as all hell, but that’s a tirade for another day. Now I don’t believe it fair to rake a book across the coals for the inclusion of a fictional caricature, so please don’t conclude that Alice’s presence in and of itself factors in the lukewarm rating above. I’ve lots of complaints about the narrative, but Alice’s lack of a historic counterpart is simply not among them. Her mouse-like demeanor bored me to tears, the fact that she is a witness rather than an active participant in much of the narrative inspired a number of yawns, and her inexplicable episode of courage in the final chapters struck me as contradictory to her nature, but I do not discriminate because she lacks real-life inspiration. Those familiar with Matthew’s legacy understand that his victims were largely comprised of the old, the poor, the feeble, the disabled, the defenseless, those who fell victim to the suspicion of their neighbors, and those upon whom others held grievances both real and imagined. Underdown chronicles this moderately well. She also offers up some great details about the realities of witch hunting over the course of the novel, but there is almost nothing about the politics or ideology behind the practice. I am not a writer, but I think the novel would have been stronger if she’d emphasized how Matthew’s ideas, which he recorded in The Discovery of Witches (1647), built on those of James I as recorded in Daemonologie (1597). Underdown’s fiction implies that Matthew was a fanatic which is entirely possible, but it fails to relay that much of what he believed was in line with both common thought and the beliefs of a king only two decades in his grave. This is a very interesting book. When you think you have it all figured out, something happens and you start doubting yourself. That is why I was never sure about the supernatural element, although I tend to think magic really exists in the book's universe. I like Alice. She is a woman ahead of her time, a woman who thinks for herself and states her beliefs. As you might imagine for 1645, that gets her into a lot of trouble. Especially with her brother. And speaking of Matthew, he is the product of deficient nurture and nature. I felt sorry for him although he did horrific things to women. I felt sorry for the child while despising the grownup. The atmosphere of the book is accurate and I praise Beth Underdown for it. It's all about fear and witch hunting. About men controlling their women. It gives you goosebumps. And the ending is simply perfect. Especially that last sentence. It will remind you that you're never entirely safe. The Witchfinder’s Sister is a tense, highly atmospheric historical drama based on fact, a book that it is easy to devour in quick smart fashion, with it’s vivid and emotionally drawn characters and a beautifully described sense of place and time. Alice loses her husband in a tragic accident and having no choice returns home to her brother. Matthew is a strange one, and deeply involved in the local community and wider, whispers of witchcraft abound and it seems no woman is safe from Matthew’s obse The Witchfinder’s Sister is a tense, highly atmospheric historical drama based on fact, a book that it is easy to devour in quick smart fashion, with it’s vivid and emotionally drawn characters and a beautifully described sense of place and time. Alice loses her husband in a tragic accident and having no choice returns home to her brother. Matthew is a strange one, and deeply involved in the local community and wider, whispers of witchcraft abound and it seems no woman is safe from Matthew’s obsession. Alice soon finds herself struggling to accept his words and actions but there is little she can do. This novel is a mix of history and psychological thriller, Beth Underdown paints a picture – a boy with a troubled past, a real life person who back in that time did what he did – through his fictional sister we see him and he is strangely sympathetic despite his cruel actions. I loved the way the dynamic was drawn between the two of them, a relationship coloured by the social outlook of the time, by the suspicions and beliefs, it was absolutely riveting. Throughout the read the writing is haunting and atmospheric, with an edge of tension, obviously well researched and cleverly addictive. I was drawn to Alice, a woman who was chained by her circumstances, who wanted to help those whose fiery focus Matthew had, unable to do much but watch on in horror. It was emotionally engaging and scarily riveting. I took in a breath at the end of the story, a few cleverly placed words made me want to clap my hands over my eyes – but from the first page to that last moment I was totally immersed in this world, not a pleasant place but still entirely brilliantly absorbing and fascinating. A big thank you goes to Beth Underdown, Ballantine Books, and netgalley for this free copy in exchange for an unbiased review. The Civil War of 1640s England is rolling on, and the hunt for witches is strong in the counties. Women are arrested and persecuted for the the most ludicrous reasons, no proof necessar A big thank you goes to Beth Underdown, Ballantine Books, and netgalley for this free copy in exchange for an unbiased review. The Civil War of 1640s England is rolling on, and the hunt for witches is strong in the counties. Women are arrested and persecuted for the the most ludicrous reasons, no proof necessary. And the Roundheads believe that their way of worship and governing is the correct way. Our fictional character, Alice, returns to town after suffering the loss of her fictional husband, Joseph. She moves in with her brother, the true to life witch hunter Matthew Hopkins. By the end of his life he was responsible for the death of over 100 women accused of witch craft or of consorting with the devil, many of whom admitted guilt. Not much is known about his life outside of his witch trials, so the author takes liberty in this story. But that in no way affects its quality. The story is told from Alice's point of view. She investigates her brother's activity as well as the secrets kept in her family that went to the grave. Matthew has no respect for females. They are all worthless whores as far as he's concerned. This includes his own sister. He's also suffered from severe scarring from a fire since childhood, which I think has had an affect on his personality. Whenever I read books like this I always ponder my possible past lives. Had I lived in the 1640s I'm certain I would have been scrutinized as a possible witch. I'm sure of it. I'm too independent, awkward, and isolated, not to mention wanton and opinionated. And I don't go to church. I always wonder if I could have held out through the tests. They sound terrible. No wonder so many pled guilty. They didn't want to suffer the torture any longer. Some went truly mad from the pain and lack of sleep. Looking through history man seems to cyclically find a populous to intimidate and persecute. The mid 1600s were old or otherwise quirky women. Evidence of religion gone wrong. One reason why I don't trust organized religion. It's not often I can read a book in one or two sittings but this marvellous book demanded it. Do not miss this! This is an historical fiction book based on witch trials in Essex England before the Salem witch trials took place in America. I knew nothing of this history going into this book. Matthew Hopkins was a true witchfinder in 1645 Manningtree, Essex, England. He has a notorious reputation for having condemned so many women of witchcraft. In this novel, his sister Alice has been living in London with her husband, Jo Thank you to Netgalley for an ARC of this book in exchange for an honest review. Matthew Hopkins was a true witchfinder in 1645 Manningtree, Essex, England. He has a notorious reputation for having condemned so many women of witchcraft. In this novel, his sister Alice has been living in London with her husband, Joseph. Joseph's tragic death means Alice must leave London and move back to family in Manningtree to her brother's home. She has not had contact with Matthew for some time since he did not approve of her husband Joseph. Alice believes her brother has been working as a scribe but soon picks up hints of what may really be going on in his home and in Manningtree and the surrounding areas. This was a very well written book and also a chilling book about how easily a woman was condemned to witchcraft with little to no evidence. The book describes the tension that existed for women who were widows or single and poor, and they would be singled out as causing misfortune to others and imprisoned as witches. A very strong book describing events in England that I would think helped to precipitate the Salem witch trials in America. Ahoy there mateys! Though this log’s focus is on sci-fi, fantasy, and young adult, this Captain does have broader reading tastes. So occasionally I will share some novels that I enjoyed that are off the charts (a non sci-fi, fantasy, or young adult novel), as it were. One standard “non-standard for me” genre is historical fiction. While I love history by itself, I enjoy historical fiction for the blending of history and getting to feel like the historical characters are real people. I mean, I kno Ahoy there mateys! Though this log’s focus is on sci-fi, fantasy, and young adult, this Captain does have broader reading tastes. So occasionally I will share some novels that I enjoyed that are off the charts (a non sci-fi, fantasy, or young adult novel), as it were. One standard “non-standard for me” genre is historical fiction. While I love history by itself, I enjoy historical fiction for the blending of history and getting to feel like the historical characters are real people. I mean, I know many of the historical characters in historical fiction books were real people, as that is the point. But I like the idea of knowing what they may have thought about the strange circumstances they found themselves in – especially if it involves women’s perspectives. This story is told from the perspective of Alice Hopkins. Tragedy forces Alice to go back to stay with her brother whom she left under less than ideal circumstances. However, when she goes back she does not find the brother that she remembers. Matthew Hopkins has gone from a nobody to one of the most important figures in the village. Why? Because he is determined to hunt down all the witches. Apparently he also wrote a book called “The Discovery of Witches” in 1647. Matthew Hopkins’ book was later used in law texts and to help catch witches located in the the United States, including Salem. While there is no historical record concerning his sisters, Matthew Hopkins likely had two. I thought telling the story from a sister’s perspective was excellent. Alice was able to give her perspective on the women she knew who had been accused, life as a woman at the time, and how women actively participated in the accusations and torture of the “witches.” Even though women were seen as technically inferior and beneath men, their pettiness and gossip could be power in and of itself, and some of them used it. I thought Alice’s story was disheartening and compelling. Every relationship shown was fraught with subtext and peril. In fact, the histories of all the characters were rich and in depth. The pace, while slow, was filled with tension and confusion about what was going to happen next. Even though it seems crazy that witch hunts existed then, I am reminded that they still occur today in some places of the world. Overall this was a fantastic book that I am glad I read. I always find myself drawn to books about witchcraft. The history of witchcraft and the witch trials is something that has fascinated me for years. When I was a child I visited Clarke Hall in Yorkshire (a wonderful museum that is sadly no longer open) on a school trip, and remember being told a story about a woman who was accused of being a witch because she used herbs to heal. She had to sneak out of Clarke Hall through secret passages and had to climb out of a window on to a horse to escape be I always find myself drawn to books about witchcraft. The history of witchcraft and the witch trials is something that has fascinated me for years. When I was a child I visited Clarke Hall in Yorkshire (a wonderful museum that is sadly no longer open) on a school trip, and remember being told a story about a woman who was accused of being a witch because she used herbs to heal. She had to sneak out of Clarke Hall through secret passages and had to climb out of a window on to a horse to escape being killed. It is a story that has stayed with me ever since I was told it at just a few years old, and sparked my interest in the obsession with witchcraft throughout our history. The Witchfinder’s Sister is written from the point of view of Alice, who is the fictional sister of Matthew Hopkins (the real life Witchfinder General). I thought it was an interesting way to tell the story, and I really felt for Alice and everything she went through. There were a couple of times when I thought this book felt like a Medieval version of Call the Midwife, but only because of certain scenes. There were other times when it was rather thought provoking, making me question the consequences of our actions, such as could doing what appears to be the right thing, and saving a life, eventually result in the death of many? This felt like a mix of historical and women’s fiction, perhaps with a hint of young adult, as the story had a sort of simplistic feel to it, making it a quick and easy read in the way I tend to experience with young adult fiction. Sometimes I felt despite it being a historical novel it felt a little too modern. Perhaps the language used, or maybe it was even the behaviour of the characters sometimes, I’m not too sure, but it was definitely a feeling I had throughout the book. Although I did enjoy this story, there were times when I was left wanting more. I think I expected it to be more harrowing than it was. Perhaps if it had been a bit longer and gone into more detail in places, keeping me in that situation for longer, I would have felt more emotional attachment to what was going on, rather than feeling I was experiencing it from a distance. On a couple of occasions where certain scenes were longer, I definitely did feel that emotional attachment. This is the story of Alice, who has to return to her home town of Manningtree in Essex after the death of her husband. She returns to her brother's house, but her brother, Matthew, has changed since she last had contact with him. He has become involved with some powerful men, and has begun the hunt for witches in the county of Essex. Alice is drawn into this work, much as she does not want to be, but begins to try to find ways to hinder her brother's quest and save whoever she can from the hangm This is the story of Alice, who has to return to her home town of Manningtree in Essex after the death of her husband. She returns to her brother's house, but her brother, Matthew, has changed since she last had contact with him. He has become involved with some powerful men, and has begun the hunt for witches in the county of Essex. Alice is drawn into this work, much as she does not want to be, but begins to try to find ways to hinder her brother's quest and save whoever she can from the hangman's noose. But she is putting herself in danger. I loved this book. It has been quite a long time since I have read historical fiction and this was perfect for me. Set in 1645 to 1647, the book chronicles the work of Matthew Hopkins, who was a real man, who did hunt for witches and the women named in the book as witches were all real people too. Alice was not real, created by the author for the purposes of this novel, but she reads exactly like a real person throughout. This was a wonderful read, creepy and unsettling at times, and I read with an increasing sense of foreboding. The ending was just perfect too, and I wanted to read the book all over again, I wanted more of it. In 1645, Alice Hopkins' husband died in a horrible accident leaving her to return to to the small Essex town of Manningtree where her brother lived to move in with him. Little did Alice know that her brother had changed though with rumors of him having a book of women's names that accused them of witchcraft. With Alice hiding a pregnancy she slowing begins to uncover the darker side of her brother Matthew. The Witchfinder's Sister is a fictional tale based on the real person Matthew Hopkins. Mat In 1645, Alice Hopkins' husband died in a horrible accident leaving her to return to to the small Essex town of Manningtree where her brother lived to move in with him. Little did Alice know that her brother had changed though with rumors of him having a book of women's names that accused them of witchcraft. With Alice hiding a pregnancy she slowing begins to uncover the darker side of her brother Matthew. The Witchfinder's Sister is a fictional tale based on the real person Matthew Hopkins. Matthew actually was known as a witch hunter in the time the book is based and was known for being responsible for the deaths of 300 women between the years 1644 and 1646. The author has loosely based this fictional tale upon his real life giving readers a look into that era. I have to say this wasn't particularly a bad book and I can see some people loving the story but for me I just couldn't get into most of it due to the slow pacing. The beginning started off rather well and I thought I would also be one loving this read but it became a bit dry for my taste after a while and I just couldn't get behind Alice or the story she was telling to keep my attention and interest for long. After pushing through the slowness I didn't mind the ending of the story too much either but in the end I decided to rate this one at 2.5 stars just for the slowness of the read to me. I liked what the author was trying to do but perhaps there was just too much focus on Alice and not even on Matthew who is the real star of the story to keep up my interest. The Witchfinder’s Sister is based on true life witch hunter Matthew Hopkins that grew to fame during the English Civil War around East Anglia, hunting and killing “witches”. This book isn’t non-fiction, it’s fiction based around non-fiction! I love these sorts of books that create their own stories from something that was very much real I think now that to be close to someone can be to underestimate them. Grow too close, and you do not see what they are capable of; or you do not see it in time. The Witchfinder’s Sister is based on true life witch hunter Matthew Hopkins that grew to fame during the English Civil War around East Anglia, hunting and killing “witches”. This book isn’t non-fiction, it’s fiction based around non-fiction! I love these sorts of books that create their own stories from something that was very much real. Not only does it make for good reading, they also bring in some true history facts, so you’re being educated on the subject as you read. High praise goes to Underdown for this novel. I feel like historical fiction can be hard genre to get right, and considering this is a debut novel, I’m amazed at how well put together and beautiful this has turned out to be! I love reading historical fiction, every once in awhile, and this is the sort of book that keeps my love for the genre burning. The writing in this novel was haunting and beautiful. Nine times out of ten, it was exactly as you would have imagined the 17th Century to be, but I felt there were a few slips that made the book feel modern. For example, would a lady in 1645 say the phrase “shitting herself” ? Correct me if I’m wrong, but that feels like a reasonably modern phrase to me. I loved our main character, Alice. Me and my mum were talking about historical fiction novels and how we find it hard to understand why women make the decisions they make in these books, because we’re so used to having some equality and independence. But I noted that in this book, even though Alice is inferior to her brother and his counterparts, she is still a risk taker; going against her brother's wishes & sneaking around. I liked that she was strong and a little rebellious, it was so much easier to connect with her because of this. On the other hand. I hated Matthew. He was a despicable character. I can rarely hate a character in a book, even if I’m supposed to. I tend to find the good in them at some point, or have some sort of sympathy for them, but I absolutely despised Matthew. Well done to Underdown for creating such a hate-inducing character. It’s quite a hard feat, but she managed it perfectly. The same goes for Mary Phillips. The tension was built so well in this novel, you could feel the mystery growing and growing with every page and I loved it! Though the story moved reasonably slowly, the book was still absolutely riveting and I found it extremely hard to put down when I knew it was time to get some rest. I am so, so excited to read more from Underdown. This was an amazingly well put together and researched. I am disappointed. I expected so much more from this book. The premise was super engaging, since all this witchcraft accusations is a very interesting topic, and specially a book focused in better understanding the motivations of one of the "hunters" sounded amazing, but I really didn't get too much from this book. -Slow, and stuck at times. Nothing happened for 180 pages, and that is too much. I don't even know why I didn't give I am disappointed. I expected so much more from this book. The premise was super engaging, since all this witchcraft accusations is a very interesting topic, and specially a book focused in better understanding the motivations of one of the "hunters" sounded amazing, but I really didn't get too much from this book. -Slow, and stuck at times. Nothing happened for 180 pages, and that is too much. I don't even know why I didn't give up. -Not enough historical information. I know this is not a historical non-fiction book, but there is not even enough facts to call it a historical fiction. I love when a HF book makes me want to know more about a historical event, but this is different to have to google what is this all about since the book doesn't give you a clue. The "war", the "king", the "papists" are mentioned few times, but you never get more information than that. I started knowing this book was set during the English Civil War between royalists and parliamentarians, and that is still all I know. I also didn't happen to learn anything else about witchcraft, witch hunt, trials than I already knew. Forgive my ignorance. I just want to point out that the book didn't add anything to my knowledge. -The dialogs are SO lacking. Every single time there was a dialog between characters I had an unsatisfying sensation I can't really explain. The dialogs didn't help me to know more about the story or know the characters better, even when they were obviously meant to do it, for example (view spoiler)[the men talking about the war during a dinner at Matthew's, or later Bridget and Alice talking during the first hanging (hide spoiler)]. Every time I read a historical fiction book, I'm reminded just how fascinating English history is, and that I absolutely bloody love this genre! Beth Underdown has done a superb job of writing her debut novel based on true events surrounding the fear and intrigue of Witchcraft in seventeenth century England. The story is based on the life of the 1640s Witchfinder Matthew Hopkins, with the main protagonist being his sister, Alice. The authors writing style created such feelings of helplessness and pity. The scenes were full to the brim of atmosphere, I could smell the filth, hear the whispers of townsfolk, visualise the clothing and wretched children playing in the gutters. It all sounds so deeply depressing, but, believe me, it was far from it. To say I was gripped by the story would be a lie. It took me just over a week to read it, which is quite a time for me, but I thoroughly enjoyed every single aspect of this book. I think it took me so long because I was savouring each chapter, hanging on to every beautifully written paragraph, and wallowing in the thought of reading another installment. A great book doesn't necessarily need to be devoured in one sitting. The Witchfinder's Sister has everything to pull the reader into the dark and terrifying times women had to endure during this period. Suspicion was rife and the threat of torture, and ultimately, death if you so much as grew any kind of herb on your windowsill filled many a woman with dread. Seems to me that male chauvinism was as rife as dysentery, and God help you dear if you have any thoughts or beliefs of your own! I'm bound to give this kind of novel the five star treatment, I just can't help myself, I can't resist historical fiction, and when Witchcraft is the subject matter, and the writing is this good, I'm sold. Oh, and before I forget, this has major cover~love from me. I'd like to own a physical copy of this just to touch and appreciate that artwork. Stunning. I'd like to thank the publisher, Penguin Random House UK, the author, Beth Underdown and NetGalley for the opportunity to read this in exchange for an honest review. I love history. I love finding out about history. I especially love it when it is about true events and real life people. I have always been fascinated by the witch hunts and I would love to go to Salem to find out more. This story is set in 1640s in Manningtree England. Which was the original place that witch hunting started before it went to Salem. Alice Hopkins returns to Manningtree after her husband has died with a little child. Obviously back then Alice has no money she can't go and find a job as back then woman weren't allowed to work. She has nowhere to live and so she has to move in with her brother Matthew Hopkins. Alice is hoping to find the house the way that if used to be. Instead she finds out that her brother is killing women but he isn't breaking any laws because the witch hunting has become legalised. Alice is finding it a struggle to stay faithful to her brother and being disgusted at what he is doing and what he has become. Alice has to go back in time and discover her families deepest darkest secrets to find out what has happened to her brother to make him do these disgusting things. Obviously this isn't a very nice subject because these horrible events really did happen. But Beth has clearly done her research on this subject. I loved Alice I though there was mystery intrigue in this book and it has me hooked all the way through and I actually really loved it. I can't wait to read more from Beth. Thank you to NetGalley, Beth Underwood and Penguin books uk for the opportunity to read this book. Thank you so much. This fictional account based on a real event in history is told through the eyes of Alice Hopkins, Matthew’s sister (or half-sister to be exact). Matthew’s mother (by now recently deceased) was her father’s second wife and with her older brothers having left home, Alice and her younger sibling formed a close bond with Alice being protective of Matthew. Badly scarred from fire burns as a baby Matthew’s life was not an easy one but he had seemed to find his own way as an adult and was well respect This fictional account based on a real event in history is told through the eyes of Alice Hopkins, Matthew’s sister (or half-sister to be exact). Matthew’s mother (by now recently deceased) was her father’s second wife and with her older brothers having left home, Alice and her younger sibling formed a close bond with Alice being protective of Matthew. Badly scarred from fire burns as a baby Matthew’s life was not an easy one but he had seemed to find his own way as an adult and was well respected, working for the well to do Essex gentry as a scriber. When Alice’s personal circumstances change, she returns home to Manningtree and hopes to find compassion and assistance from her brother. However what she actually finds turns into a nightmare. For Matthew is not the kindly and sympathetic brother that she seeks but is hell bent on his own mission. To rid Essex and the surrounding towns and villages of women that have been named as witches. The story begins with an intriguing premise. It is 1645 and Alice appears to be imprisoned but we know not why or by whom. We then learn of her arrival back in Essex nine months previously and of the events that led to her present predicament. It is clear that the author has meticulously researched the period and events and the evocative description of the landscape and the way of 17th century living, bought the story to life. The sounds and smells; the clothes and living conditions – all were so well described with an excellent sense of place. The story is a mixture of history and fiction but there is also a little bit of a suspense element too with secrets of the past slowly being revealed and the feeling of fear as to what was about to happen next. It was clear that Matthew was a man obsessed with his mission and the cruelty dished out to such women suspected of being witches showed him to be utterly heartless. A woman could be accused of witchcraft by a neighbour or any other person with a grievance – for the most spurious of reasons and in many cases, ‘confessions’ were garnered through torture. Matthew was in many ways a fascinating character and rather contradictory. At times he appeared vulnerable and scared; there were occasions when he seemed to treat Alice with brotherly consideration but despite this I always had the feeling that he was storing away the words and actions of others that later could be used for his own benefit. He was not a man to let resentment go but instead harboured it and let it fester, perceived slights would be remembered for later. His disfigurement surely played a part here but so did parental influences. He held this belief that women were to be regarded as sinful creatures and of far less importance than men. “….I thought, surely she cannot be soft for him – for my brother, who had always looked at a girl as at some strange item brought in by the tide”. Alice was the star of the book for me. She wasn’t perfect by any means but she was the counterbalance to Matthew’s obsessive and pious nature. Where he appeared to be devoid of any human feeling or empathy, she was kindly and sympathetic and wanted to help those she believed had been unjustly treated. When she was taken to a ‘watching’ – where an accused woman was tied in a painful position to a stool for hours on end and suffering whatever other indignities could be thought of to try and make her confess her sins, she did what she could to comfort and treated the women with as much gentleness as she could get away with. Set in 1645, this takes an interestingly slanted perspective on Matthew Hopkins, the notorious self-styled Witchfinder General. The story is told by his half-sister Alice who returns to Manningtree in Essex to find her brother embroiled in accusations of malice, spelling and witchcraft aimed mostly, though not exclusively, at women. This is not an unfamiliar story but Underdown approaches it with a welcome lack of sensationalism. She keeps her canvas relatively small and domestic, exploring the Set in 1645, this takes an interestingly slanted perspective on Matthew Hopkins, the notorious self-styled Witchfinder General. The story is told by his half-sister Alice who returns to Manningtree in Essex to find her brother embroiled in accusations of malice, spelling and witchcraft aimed mostly, though not exclusively, at women. This is not an unfamiliar story but Underdown approaches it with a welcome lack of sensationalism. She keeps her canvas relatively small and domestic, exploring the shifting emotions between the main characters. This does mean that the witchcraft theme sometimes gets quite submerged as the foreground of the novel concerns itself with Alice's marriage, her miscarriages, her relationships to her dead parents. Less successful for me is the anachronistic way in which the book makes sense of what is happening in terms of the accusations: explanations based on long-held grudges and Hopkins' Freudian psyche ((view spoiler)[ 'I pitied Matthew. I knew I had hardly scratched the surface of the horror he must feel, if underneath he was aware that it was Mother who had harmed him and on purpose' (hide spoiler)]) mean that the atmosphere is determinedly modern in outlook and thus rather simplifies what was going on at a time when only about 50 years before even the king, James I, had written a treatise on witches. I would have liked to have seen a more sophisticated awareness of the historicised way in which superstition, religion, politics and 'magic' were woven together to culminate in the witch trials. And the irony of Alice's plans to emigrate to a quiet little town in New England called Salem is delivered with a very heavy hand. Despite a few niggles, though, this is an engaging read and delivers a fresh approach to a well-known, shameful episode in English history. I am a huge fan of historical witchy fiction, and this book was mostly superb. Told by Alice, whose brother Matthew hunts, persecutes, and helps to hang women accused of witchcraft, the story is disturbing and compelling, despite the oft times archaic language. My only criticism is the lack of emotion I felt from Alice. Throughout her tale, she suffers many tragedies and losses, but I just didn't really feel much. While she lived with Matthew and I received this book for free through NetGalley. I am a huge fan of historical witchy fiction, and this book was mostly superb. Told by Alice, whose brother Matthew hunts, persecutes, and helps to hang women accused of witchcraft, the story is disturbing and compelling, despite the oft times archaic language. My only criticism is the lack of emotion I felt from Alice. Throughout her tale, she suffers many tragedies and losses, but I just didn't really feel much. While she lived with Matthew and he forced her to accompany him on his "travels", she thought about leaving but never really tried. I do realize how women were not independent like we are today, that Alice was at the mercy of her brother's generosity, but I still believe, had I been put in those disgusting situations, I'd have tried my hardest to run away from all of that. Of course, that's my story, and not Alice's. The very best of the book, is the final sentence. I am hopeful for a sequel. A really great read. A fabulously strong debut, focusing on witchcraft in the 17th century. I really enjoyed this book. It centres on Alice, a recently widowed woman who returns to live with her brother - a relatively taciturn, unpleasant individual who happens to be on a mission to condemn as many woman as possible to death for witchcraft. Based loosely on real events, it's an engrossing account of life in the 17th century, and the supers I received a copy of this book from Netgalley, in exchange for an honest review. Based loosely on real events, it's an engrossing account of life in the 17th century, and the superstitions (and hideous unfairness) of the process involved in witchcraft trials. The characters are brought to life beautifully, and there's enough mystery in the book to keep you reading right until the end. The writing does a great job of really bringing the 17th century – not an era I have read that much about, to be honest – to life, with insights into the economical and social setting of that time which led people to start blaming their own misfortunes on other people. I have to say I felt it was not unlike a certain President who has managed to persuade people in his country with a crap or unfortunate life that this must all be because of immigrants. Of course at the time that this novel is set, the misfortunes of East Anglia (in fact, probably most of the country) seem to be blamed on witches and witchcraft. Sometimes people can’t just accept that bad things happen, no matter how awful they are; they’d rather believe that it’s actually because of people who don’t attend church regularly, or who may have a disability that makes them seem ‘strange’ or different. Reading The Witchfinder’s Sister I certainly picked up on certain conditions that we know a lot more about today, that at the time must have seemed frightening, unknown and therefore undiagnosed, leading people to mark them out as potential witches. Today we’d be able to deal with it all a lot better with scientific and medical knowledge. The only thing I didn't like was that some parts of the novel felt a little slow and could have been a bit more gripping, in my opinion - but others would disagree, I'm sure. Most of the writing, however, is rich and atmospheric and I really liked the ending. Though it’s not a quick read due to the language being a little more old fashion to fit the setting, it’s not a particularly hard read and I’m sure anyone with even a small interest in that era – or in history in general – will enjoy reading this novel. I was interested to read this as it was about Matthew Hopkins "Witchfinder General" I had seen the old movie with Vincent Price in it and knew a little of the history of this terrible man. However, what also interested me was that a lot of what happened, happened in my part of the country including the hanging of several women in my city. The book, although written as fiction contains many facts about the real Matthew Hopkins and his ways of discovering witches. One thing that is very apparent th I was interested to read this as it was about Matthew Hopkins "Witchfinder General" I had seen the old movie with Vincent Price in it and knew a little of the history of this terrible man. However, what also interested me was that a lot of what happened, happened in my part of the country including the hanging of several women in my city. The book, although written as fiction contains many facts about the real Matthew Hopkins and his ways of discovering witches. One thing that is very apparent though, it was not safe to be an old woman, living alone or widowed when he was about! The story is told through the eyes of a fictitious sister "Alice Hopkins" She and Matthew have three older brothers who live in the Americas. Alice has been away from the home (In Manningtree) for a few years when she married a local man called Joseph who had recently died. She has no choice but to return to her brother's protection. Matthew's mother, her stepmother has also died. Alice is shocked to see how much her brother has changed in person and the company he keeps with the important men of the town. Stories of witch trials have reached her and of her brother's involvement in bringing them about, but at first Alice doesn't take it too seriously, thinking that the women will just do some time in the gaol and sent home, reprimanded. Things start to escalate though as more people are accused, even a daughter testifying against her own mother (which did happen) There are little excerpts on how to find out a witch (which I assume come from Matthew Hopkin's book "The Discovery Of Witches") There is also a fragment of a transcript that was to do with the witch trials held in Chelmsford.